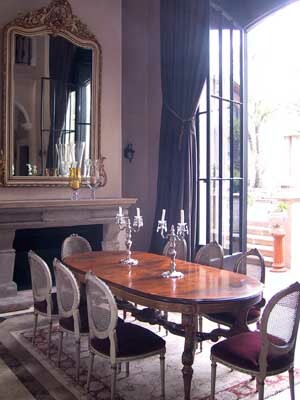 Found in Sanhurst , Johannesburg, this magnificent boutique guest house accommodation in the style of a French Chateau features exquisite French décor, charming gardens and a unique ambience. Elegance, luxury and style in the prestigious suburb of Sandhurst, close to Sandton City, Hyde Park and Rosebank. Set in peaceful, secure grounds, Le Chatelat offers quiet sophistication for the discerning traveller and business executive. Spacious bedrooms in the main house and two private garden cottages with kitchens are exquisitely decorated with antiques and classic pieces. Start the day with the morning papers over a generous breakfast served on the terrace in summer. Swimming pool. Transfers arranged. Secure parking. Services offered include internet, airport transfers, laundry, dinners and lunches arranged with personal chef. Set in the premier suburb of Sandhurst, Le Châtelat is an ideal base for the discerning visitor and travelling business executive who wishes to be close to Sandton’s vibrant CBD, cosmopolitan Nelson Mandela Square, stylish Hyde Park or trendy Rosebank. The Sandton Convention Centre, Wanderers Sports Club, major business and shopping centres and gyms are minutes away.